Finding The Right Career Tip# 4: Consider Starting Your Own Business. Perhaps you’re starting to feel worn down and burnt out due to a long commute to and from work, or you have a difficult boss to work for, or perhaps you just don’t seem to get on with some co-workers….. The idea of starting your own business and working for yourself can be quite appealing. Even in the current economy it is still possible to find your perfect niche. Depending on the type of work or business you are looking into, remember that some big companies still prefer to streamline their ranks of permanent workers and look at working with or hiring outside vendors. However it is most important that you do all your homework and understand everything that is involved with running your own business before you jump in. *Make sure you are both passionate about and committed to the line of work or business you will be moving into. It will take many long and hard hours to get started and it could take quite a while for your business to actually pay off. *Research, research and research some more! Doing your research is critical, so take your time to consider – what is your area of interest? What work do you like to do? Are you going to be meeting an unfulfilled need? Or are you going to be competing with others? If you are considering an online business is it a product or service that will be well used and needed? Do you have a business plan? Do you have investors arranged? Will you need investors? *In the beginning be prepared to have no real income from your business. In the first few months, while you are building up your business you may find that start up and running costs are eating up your profits, so have a plan on how you can cope all drawn up. *Work out why a customer will come to you and not someone else? Are you cheaper? Better, faster to provide a service, more convenient? When you work out what is making your business different, focus on that as your main marketing message. *Keep your goals and plans in sight, why ARE you going into business? What is the dream that is inspiring you to go out on your own? There will be times when you doubt what you are doing, but never lose sight of your goals, you can make it work. *Great service – always value customer feedback, good or bad, it will alert you to what you are doing right, and what you are doing wrong. Remember no matter what business you are in, there is always going to be someone out there wanting to do it better, cheaper and faster than you. You must always focus on giving your customers great service – try and do something different or special so they will never feel like they have to take their business elsewhere. *Always add to your skills and knowledge – a business will only grow as fast as the person owning it. Avoid staying in the past, any new skills you learn can be applied to your business, never be afraid to try new things, as they say – move with the times… make sure your business has or runs with the very best in technology, you don’t want to get left behind. *and finally – surround yourself with the right people. Never be afraid to ask for help, if you need help hire someone in. By outsourcing someone you are then free to promote your business or work within your business doing something else. Have you left your job and started your own business? Have you been given the chance to become your own boss through your job? 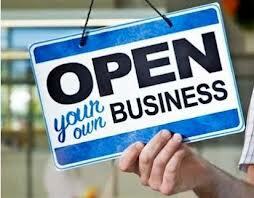 Would you like to start your own business? What are your plans?